I don’t know about you, but I’m still enthralled by a wonderful children’s book — especially when there’s a mystery or puzzle at the heart of the adventure. 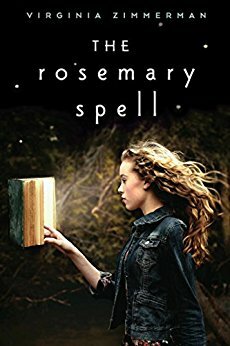 The Rosemary Spell is a perfect book for middle-grade readers who want a little magic, a little mystery, and a lot of friendship. This is a book about the power of books, and Virginia Zimmerman is an expert on that. You can learn more about her on her website, including links to an article she wrote on the importance of letting — or even encouraging — children to re-read. Teachers, do not miss out on the fantastic teacher’s guide that was created for The Rosemary Spell by Pamela Brunskill. In particular, if you teach poetry or want to introduce your cherubs to Shakespeare, The Rosemary Spell is the book to check out. We talked about some favorites for children: A Wrinkle in Time, A Ring of Endless Light (both by Madeleine L’Engle), the Harry Potter series, and one that is new to me, When You Reach Me, by Rebecca Stead. For adults, Virginia gave a shout-out to Middlemarch by George Eliot and Pride and Prejudice, my favorite Jane Austen novel (and I know I’m not alone!). Keep tabs on Virginia and her upcoming books via her website, on Twitter, on Instagram, and on Facebook. As always, if you’d rather read than listen, the transcript is below. Laura Brennan: Virginia Zimmerman writes novels for young readers and teaches English at Bucknell University for somewhat older readers. Her beautiful middle-grade novel, The Rosemary Spell, has at its heart a book, and with it all the magic and mystery that books bring into our lives. Plus, in this case, there’s a smidge more magic and mystery than usual. Virginia, thank you for joining me. Virginia Zimmerman: Thank you for having me, it’s great to be here. LB: So, you’re both an author and an English professor. Tell me a little bit about that career path. Was it always going to be books? VZ: It was definitely always going to be books, from kindergarten when I would read to the rest of my class, it was always going to be books. But exactly what that meant was less certain. I decided pretty early in college that I was going to major in English, but I didn’t have the intention of going on to be an English professor until pretty late in college. And then even when I became an English professor, I did that because someone said to me, you should think about what you like to do and then you should choose the career that allows you to do that. Which of course is easier said than done. But in my case, what I liked to do was read and write and talk about books. So being an English professor was the obvious way to continue to do those things. I didn’t even really think seriously at all about writing books until well into my career. I had been at Bucknell as a professor for several years before I started writing. So yes, it was always going to be books, but it wasn’t always going to be the case that I was writing those books. That was a relatively late development. LB: The Rosemary Spell is a book about the power of books. LB: So, for someone who hasn’t read that yet, what do they need to know to be able to follow our conversation? VZ: Well, The Rosemary Spell follows Rosemary and her best friend, Adam, as they find an ancient book locked in a cupboard in Rosemary’s room. They’re immediately intrigued by the book because they are both book lovers themselves. They quickly discover a poem in the book which has the power to make people disappear, not just physically but also from memory. They accidentally disappear somebody very important to them and have to work hard to undo the magic. The poem they stumbled upon – – so, they kind of found their way to that dark magic spell without a lot of effort, but they have to work very hard to figure out if there is what I think of in my head, although honestly I don’t remember if I ever use this expression in the book, they have to find an antidote poem. And that requires a lot of effort. LB: I almost don’t know where to start because there are so many wonderful threads woven into this book. But let me start with Shakespeare. LB: Very early on, you bring out the idea that Shakespeare’s poetry is a type of monument that will last longer than stone because homes are made of words and, in a way, every time someone says the Palmer learns the poem, it’s sort of rebuilt anew. VZ: Yeah. That’s a really lovely way to put it and I take that idea from Shakespeare himself, who writes about it in one of his sonnets which Rosemary and Adam read in their creative writing class. So Shakespeare’s articulation of the fact that words last more than anything else does, more than stone or any other kind of monument, that’s his idea. And I riff off of it throughout the book. LB: And you imbue the words with powers beyond anything else. VZ: Yeah, I mean — I like to think that the book has two different origins, and one of them is Shakespeare. And it goes back to the story that people in the theater world know, that the witches in Act IV of Macbeth speak an actual witch’s curse. I was involved in theater when I was younger and that was a legend that I knew well and was impressed upon me by my colleagues at the theater, and I was really enchanted by the notion that there could be actual magic in Shakespeare. And then as I got older and became a more sophisticated reader, I realize what I think anyone who reads Shakespeare knows on some level, which is of course there’s magic in Shakespeare! It’s all magic because of the power of words. But why not make that manifest as actual magic? So I feel like that origin in that legend — and I took from that legend the idea that okay, if there’s magic in one little piece of Shakespeare, couldn’t there be magic elsewhere in Shakespeare? And that’s kind of the thought experiment that launched the book, but as you’re suggesting, it’s also bundled together with this belief and faith that I have that words really are magic. They help us remember things, they help us know who we are and what we believe. And that may not be magic in a witch’s brew kind of sense, but it is absolutely magic. LB: Another theme is that the books you read as a child become a part of who you grow up being. VZ: Yes. Which I really believe. I talk about that a lot when I go to schools and talk with kids, and I also teach children’s literature at Bucknell, and I talk with my students about that a lot. It’s interesting to me for a couple of reasons; one is that it makes the books written for young people really important. I mean, books that adults read also influence who they are and how they think, so I don’t mean to suggest that they don’t. But children are in the process by definition of becoming who they are going to be, and so the things that impact that process take on a really special importance and I think for many, many kids, books are important. Really important. And when I talk to kids, I always show them a slide of Madeleine L’Engle’s A Ring of Endless Light, which is the book that I point to as the single book that I sort of held onto that got me through my youth. And when I go back and reread it now, I see all these traces of myself that I didn’t necessarily realize were rooted in that book, but actually are. I think everybody has that book. It may take a while to figure out which book is the book that mattered the most to you, and it may be different books for different purposes, but I think acknowledging that the books that we read we’re young play a really central role in making us who we become is really important. LB: One of the books for me was A Wrinkle in Time. LB: And you bring in some of those books, including A Wrinkle in Time, you bring them into the lives of your characters. VZ: Yes. I really wanted to show that using what they’d read to help them not just figure out who they are, which is important and they do talk about that, but to actually make strategic decisions about how to navigate the challenges that they’re facing. And they use A Wrinkle in Time in a very specific way to help them understand something that’s happened. But I wanted to dramatize that act of drawing from what you read as you move through life. LB: How is writing for children just a completely different animal from writing for adults? VZ: So, I would say that some of the things that distinguish writing for children — two things that I think are particularly interesting. The first is what I already said, that children are in the process of becoming who they’re going to be and what they read really matters. And as I said, that’s true for adults reading to a lesser degree, but it’s got an urgency for children. As they’re reading, they’re thinking about themselves, they’re shaping themselves in pretty active ways. And so it raises the stakes of writing for children in ways that I find sometimes daunting, but always sort of thrilling. And the second thing I would say is that, particularly middle grade readers, which is my target audience, are fascinating to me because they’re on the cusp of being independent in terms of making their own choices about what they’re reading. Little children reading picture books or easy readers very rarely make their own selections of what they’re going to read. Books are given to them by the adults in their lives, teachers, librarians, parents. And once you get into YA, young adult readers, those readers are mostly choosing books for themselves. They are still accepting recommendations from the adults that they’re willing to listen to, but for the most part they’re choosing their own reading. Those middle grade readers are sometimes making their own choices, sometimes being guided to books by adults, and that means that when you write for that audience, you’re writing both for those kids and for the adults who are curating the reading experience for those kids. And I really like that notion of the double audience. But you have to be careful in thinking about that double audience to not then talked down to the children in the audience, which I think is really important and I think all good writers find a way to treat the children and adults in their audience with equal but perhaps different respect. LB: Well, one of the things you wrote for adults was an article for parents on the importance of letting children reread books. VZ: Yes. Yeah. And I think my main argument in that article was that a lot of the ways that children are encouraged to read formally, mostly at school, with different kinds of reading, comprehension checks or reward programs for reading, that while there are good things about a lot of those, they fundamentally discourage rereading. Once a kid has gotten the checkmark next to a book, they can’t get a second checkmark next to that book, they have to move on to another book. And I think anyone who even just loves to read or who majored in English or is a writer or astute reader, knows that when you reread, you read differently. One thing I say in that article is, rereading is always an act of critical thinking. Because you already know the story, you’re starting to pay attention to how the story gets told. And even young, young readers can start to understand how you make a story, how you choose the words, how sentences are shaped even, when they reread. And I think that that’s incredibly valuable and unfortunately lost in some of the ways kids are taught to read these days. LB: What books do you reread? VZ: Oh, gosh! For adults, I reread certain 19th century novels pretty regularly, partly because I teach them, but really I teach them because I want an excuse to reread them. So I read Middlemarch every couple of years. I read some Jane Austen, usually Pride and Prejudice every couple of years. And part of what I really enjoy about rereading those books is that they are constantly changing for me. Middlemarch is a great example because when I read it for the first time in college, I was more or less the same age as Dorothea Brooke, one of the main characters. And for me, the book was all about her and everything that wasn’t about her, I kind of skimmed or shoved to the side. And then I reread it a few times, and then when I settled at Bucknell, which is located in a small town, and I had never really lived in a small town before, all of a sudden I realized that Middlemarch is a brilliant characterization of life in a small town. And I’d never seen that before. Because I didn’t have any occasion in my own life to prompt me to pay attention to that. Which for me is a great example of how a single book becomes many different books as the reader approaches it at different points in life or from different perspectives in life. For kids, I reread — and it’s a cliché but it’s true — I reread the Harry Potter books pretty regularly. And I reread Madeleine L’Engle whenever I have the opportunity. LB: I think the Harry Potter books are brilliantly put together. VZ: They’re so brilliantly plotted. When I first started reading them, I wasn’t yet a writer myself, and so I was enjoying the story and reading them as a scholar of English, but not reading them as a writer. And as I’ve become a writer, rereading them from that point of view has been a wonderful education for me. J.K. Rowling is just brilliant at plot, and at making plot not feel like plot. LB: Your book, The Rosemary Spell, is a very intricately pieced together puzzle. Mysteries for adults almost invariably mean murder, but that is not at all true for children’s mysteries. VZ: That’s right. In fact, when you and I had our first conversation about my book, I was sort of apologetic and said, well, Amazon calls it a mystery but it doesn’t follow the rules of adult mystery. But you’re right, that children’s mystery follows different rules. I think the emphasis is more on the active problem-solving and less on a crime that was committed, or maybe less on the cause of the mystery and more on the solving of the mystery. LB: So what do you think is the allure for kids in mystery? VZ: Well, I think is the same as it is for adults in that there’s something you don’t know and you want to figure it out. But I think there’s the added piece, particularly when in a mystery for children it’s child characters who are solving the mystery, of getting to go through the exercise of solving the mystery along with the child characters. And kids, I mean all readers, really, like to feel smart. They like what they read to remind them of their own strengths. And so when you’re reading a mystery and you start to figure out, well, look over here, or, I think in the poem this word might mean this other thing, and then the characters get there may be half a step after you do, you feel rewarded for your own intelligence and that’s a very satisfying feeling for a reader. LB: One of the things that you say on your blog that I just found enchanting was the idea that, when you’re writing, you’re carving, you’re finding your David. LB: With The Rosemary Spell, it’s so, it is so very intricate and it does have so very many themes that seamlessly wind together. What was the experience for you a finding that David? VZ: Well, it was first of all a very long experience. As a, essentially, a first novel it took many many iterations of the story and the David analogy is really apt. For people who may not know what that reference is, the story is that Michelangelo looks at a solid block of stone and sort of sees David in it and has to chip away at the stone to find David within the rock. A lot of authors use the analogy of building a story, molding it out of clay, and I think that, I can think of times when that has felt like the right analogy to me. But with The Rosemary Spell and also with one of the books I’m working on now, the David analogy really works much better for me because the things that I was doing wrong in drafts were almost all things of trying to put into much. Having a subplot, having more characters than were necessary, basically cluttering the landscape of the story with things that made it hard to see the ways the themes were connected. And I just was constantly shedding language and detail and plot in order to get to the kind of pure nugget of story which then could become something bigger because I take away all the stuff that was just in the way of it. LB: One of the hallmarks of The Rosemary Spell to me reading it was how there was room in it for everything and I didn’t feel at all overwhelmed by what was there. VZ: Yeah, and I think — I’m delighted to hear that it has that feeling, and that is a consequence of lots of labor of making room. Because a lot of the room in the story to think about it in kind of physical terms, was filled up with debris. I had to come to recognize what was debris and what was actually essential to the story and then clear out the debris. And I should say also, just at the level, at the sentence level, that my editor at Clarion Books, Dinah Stevenson, is just a genius at seeing the clutter in my prose and teaching me to see it. So now as I write, I’m confident that when my next book goes through the editorial process, there will be stuff to cut out, but I think I’m doing a much better job of allowing my phrases and my sentences to be pure then I used to, having worked with her. I sort of feel like she sits on my shoulder, and I say okay, what would Dinah do here? Dinah would cut that phrase. And then I cut that phrase. LB: On a different note, some of the people who come off extremely well in your book are teachers. LB: I love how inspiring, for example, the English teacher is. Did you have teachers who inspired you? VZ: Absolutely! English teacher in the book, Mr. Cates, is not modeled on a specific teacher but is kind of an amalgam of many different English teachers that I had at many different levels. I take his name from the language arts teacher who I had in fourth, fifth, and sixth grade — she was Mrs. Cates, not Mr. Cates — but she’s only one of a fairly long list of English teachers and teachers more broadly who made a real difference to me and how I understood the way the literature worked. And also just in that kind of ill-defined, inspirational tone that I think he takes. I try to create a sense that the students, many of them, are eager to do what he asked them to do because he so communicates his passion for literature and for writing. I definitely had teachers, not just in English, but in other subjects too, who did such a good job of communicating that passion and that’s what I’ve tried to encapsulate in that character. LB: For any teachers who are listening to the podcast, I should also mention that you have created an incredibly detailed teacher’s guide with lesson plans and all sorts of fun ways to engage with The Rosemary Spell. VZ: Yes. The teacher’s guide was actually created by one of my critique partners, Pamela Brunskill, who is a specialist on reading and knows way more about the Common Core standards than I could ever hope to know. And she created that teacher’s guide and it is truly extraordinary. It’s so much more detail than I ever would have imagined was possible. She’s got great exercises for every couple of chapters and vocabulary lists and all sorts of stuff that make the book really easy to teach for teachers who want to take that on. LB: Do you have any books that you would recommend, especially for middle grade readers? VZ: One thing that I would say, because you mentioned A Wrinkle in Time, a really fantastic book that I think would be classified as mystery is When You Reach Me by Rebecca Stead. Which is one of the books that Rosemary mentions in The Rosemary Spell and I think is one of most perfect books written in recent years. We were talking about how great J.K. Rowling is at plotting and When You Reach Me is just brilliantly plotted. It’s maybe for a slightly younger audience, 8- to 12-year-olds, I would say, but it’s such a brilliant book that older readers would enjoy it as well, especially any readers who have a fondness for A Wrinkle in Time. Because the main character in When You Reach Me sort of carries around a wrinkle in time and engages with it in ways that turn out to be quite important in the book. LB: So, Virginia, what is next for you? VZ: I have actually been working sort of simultaneously on two different books, which is not necessarily something I would recommend. One of them is the book that I wrote immediately after The Rosemary Spell. Right now it’s called The Oath Stone, although I know that titles change so we’ll see what happens with that. And it’s a story about a girl who discovers a stone that takes her back to prehistoric Orkney. The Orkney Islands are off the northern tip of Scotland and there are some really fantastic prehistoric ruins there. She’s there in the present and ends up getting to go there in the past. And that’s really just about finished and will go to my agent and hopefully land on an editor’s desk soon. And then I also have a full draft that needs to be revised of Pelagia’s Boats. Pelagia’s Boats is the fictional book that Rosemary talks about throughout The Rosemary Spell. She talks a lot about real books that readers might know, but her favorite book is a book I made up called Pelagia’s Boats and I have now written that. Which was incredibly difficult because setting the standard of my beloved character loving this book so much meant that I had to write a book that would be worthy of her love. And it was staggeringly difficult. So next up for me will be revising that and hopefully getting that often to the world as well. LB: So if people want to learn more about you and your upcoming books work and they learn more about you on the web? VZ: They can find me on my website which is easy to remember, it’s www.VirginiaZimmerman.com. I’m on Twitter @VZauthor and same handle on Instagram, @VZauthor. And I also have an author Facebook page. LB: Fantastic. Thank you so much, both for writing The Rosemary Spell which is one of my new favorite children’s books, and for joining me here today. VA: Well, it’s been such a pleasure talking to you. Thank you so much for having me.